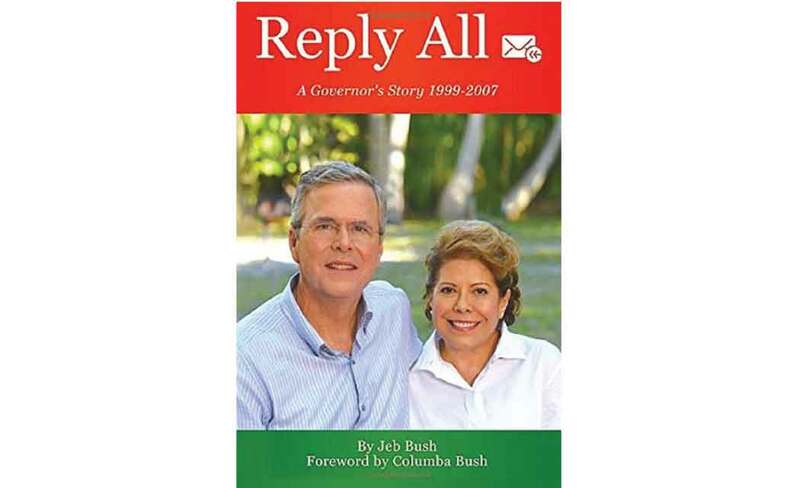 MIAMI — Republican presidential candidate Jeb Bush on Monday released his long-planned e-book, “Reply All,” a selection of email exchanges with everyday Floridians, journalists and others during his two terms as Florida governor. Bush’s publication of the 730-page digital book comes as he attempts to reset a campaign hobbled by stagnant poll numbers, a fundraising slowdown and a poor debate performance. On Monday, Bush officially begins his “Jeb Can Fix It” tour in Tampa, pitched as the start of his campaign comeback. The e-book covers his two terms as governor, 1999-2007, when he carried a Blackberry at all times, spending 25 to 30 hours a week emailing and responding to a diverse range of people through his public and personal email account. The Blackberry was included in Bush’s official portrait as governor. Since launching his presidential campaign in June, Bush has repeatedly pointed to his record and experience as governor to sell voters on why he should be the GOP’s next nominee. On the 2000 presidential election recount, Bush wrote: “As governor I was somewhat embarrassed about how difficult the recount became. Who had ever heard of ’hanging chads?” The razor-thin margin in Florida between his brother, George W. Bush, and Vice President Al Gore, led to a contested outcome resolved before the U.S. Supreme Court. More typical were emails with everyday Floridians like a woman complaining in 1999 about problems caused by tractor-trailers on I-75 and a man outraged in 2006 over the state’s skyrocketing homeowner insurance rates. He also shared his mixed feelings on receiving an email from a 32-year-old black single mother who praised him at the end of his gubernatorial tenure, but said she was unconvinced he cared about African-Americans. “All people matter to me and I have tried as hard as I can to prove that,” Bush replied. He also included email exchanges with current GOP rival and fellow Floridian Marco Rubio. “I couldn’t resist ribbing my friend Marco Rubio just a little,” wrote Bush in a 2006 email when Rubio’s office responded to his email with an automated reply. Rubio was House speaker at the time. “Automated response!!! …,” Bush wrote back with 26 exclamation points. Next post What goes on inside the mind of Don Lemon?